Juggalos can’t catch a break. 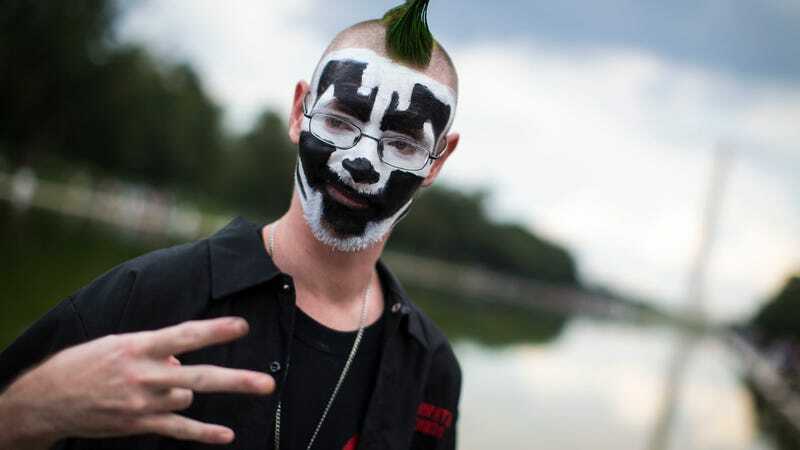 The misunderstood fans of the Insane Clown Posse have it hard enough with the FBI classifying them as a “gang.” Now, the proprietors of a bar in Michigan are pointing a finger at the Faygo-loving clan after a Valentine’s Day gathering ended with the establishment receiving 500 DMCA notices for illegal downloads. Noisey spoke with Scott Bell, the talent booker for Mac’s bar in Lansing, Michigan, about the alleged incident. Bell said that he booked a local Juggalo Valentine’s Day hip-hop show earlier this month and everything went fine. He then went on a brief tour in Europe with The Menzingers, a punk band that he manages. When he returned, he was greeted by a big white box that arrived in the mail. At first, he thought Comcast had sent a new router. But no, “they sent us 500 pages of the same DMCA notice.” Each one was a for a different song from the back catalog of the Memphis hip-hop legends Three 6 Mafia. At first, Bell was confused that someone felt the need to download every song by Three 6 Mafia on his little dive bar’s Wi-Fi. But then he “did some detective work” and saw that all the download happened between 9:40 and 10:30 PM on the same night as the Juggalo Valentine’s Day bash and it all came together. If a torrent-happy Juggalo is to blame, Bell isn’t mad. He even suspects that it could’ve been an inside job. He guesses that it could’ve been the sound guy working that night, “cause they’d need a laptop.” And he says he might just offer them his SoundCloud password.